Extras like extra programs, files and other things that I've made. A command line program for encryption and decryption of files. The program uses a 256-bit AES (in CTR mode). The program uses a (built-in) key strengthening algorithm, this increases the security. The program stores an encrypted checksum of the original file, which is verified at decryption. The program delivers an ErrorLevel code which indicates success (0) or failure (1). The speed is measured and the program will display the results for you when it's done. Use the parameter "-NoPercent" to display the number of Bytes that has been processed instead of percent. Important information: Save the downloaded program if you have information encrypted with it. I do not guarantee compatibility between different versions/revisions of the program. Revision Date: See file date. See also AS-ARC5, AS-ARC6, AS-QuadCAST and AS-QuadHC128. A program for encryption and decryption of text. The program uses a 256-bit AES (in CTR mode). The program encodes the encrypted information. The program compresses the text (if possible) to increase the security. The program stores an encrypted checksum of the (possibly) compressed original text, which is verified at decryption. Press [F12] if you want to show or hide the password. A command line program to add/update all programs from Andreas Software into a proper (recommended) location. The recommended location to put all files from this website is in a folder named "Andreas Software" in the root of your system disk. The program takes care of most of the steps needed to add/update all programs (except for shutdown of running programs inside the folder) which includes create/wipe the folder, download the correct Zip file with all programs, uncompress them and create a shortcut to the folder on the desktop. A program for the classic ROT13 chiffer. Press the button to rotate A-Z, a-z and also 0-9 if you check the "ROT5" checkbox. A program to verify the check digit of a numeric sequence with the Luhn algorithm. Specify the whole numeric sequence, besides the check digit, which will then appear in the verification box. A program to securely generate a list of random numbers. Just specify how many numbers to be selected and specify lowest and highest number. 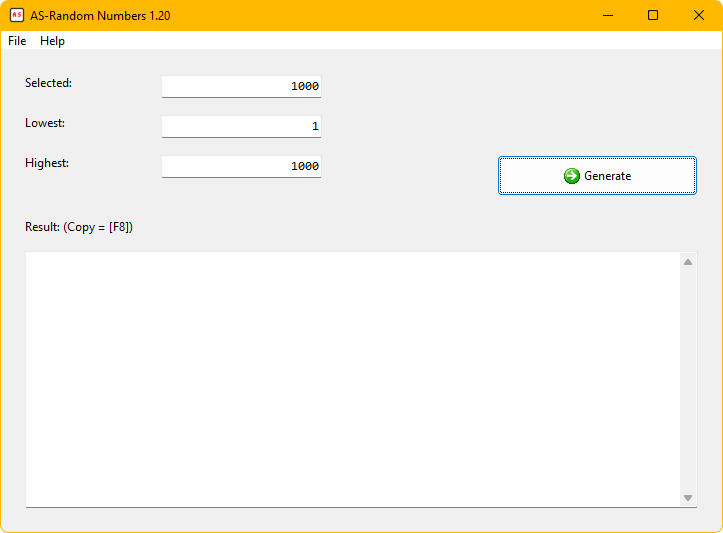 The program makes sure that all generated numbers are unique, which means they will only appear once in a generated list. You can generate up to 10,000 numbers from 0 to 999,999. A program which shows current date and time with shadowed text, both in speakable and classic format. This program iterates through your computer's local IP Addresses, displaying each one and lets you copy the currently displayed IP Address to Windows Clipboard. Press OK to copy and show next or press Cancel to show next without copying. This program loads a JPEG image and creates a circle image with an alpha channel and saves it as a 32-bit PNG image. The program does this with Anti-Alias to get smooth edges. Worth noting is that the program does not remove the other information in the image, if you would open the image in a program that does not use the alpha channel the whole image will show up without the circle. A program which can change the gamma values for the components red, green and blue to get the environment you want. The program can also offset the color components to better control the grayscales. Windows has a built-in protection which makes that a program won't be able to make too big changes, I have included a REG file which lets you disable this protection (restart required). Information: The program only creates and loads the gamma table, there is no functionality of making the changes persistent. If you want the changes to be persistent - create a shortcut to the program (with the parameters) in Startup and also make sure that no other programs modifies the gamma table. Also keep in mind that if you are using the computer's energy saving mode/lock mode the gamma table will be reset, you can use the "Task Scheduler" in Windows to automatically run a program after energy saving mode/lock mode. E.g. Run => "C:\Andreas Software\AS-CC.EXE" "/Monitor=1" "/RGamma=80" "/GGamma=70" "/BGamma=60" "/ROffset=+16" "/GOffset=+4" "/BOffset=-16" => OK.
A command line program to up-scale "pixel-art" with rounding of the squares. You enter a value from 1 (2 × up-scaling) to 8 (256 × up-scaling). The program deals with images in the BMP format. Use the parameter "-NF" to not apply the filter. The result of using this parameter will be "pixel resize". You can also download AS-EPX 1.0 which uses the EPX algorithm but with optimizations made for the Scale2X algorithm. The result is a slightly faster EPX/Scale2X. A command line program to up-scale "pixel-art" with rounding of the squares. You enter a value from 1 (3 × up-scaling) to 6 (729 × up-scaling). The program deals with images in the BMP format. The Scale3X algorithm can round the squares even more (than the Scale2X algorithm). See LonelyPixel-Scale2X.PNG and LonelyPixel-Scale3X.PNG. A command line program to create an image of a text and add a "fancy" effect. The color scheme "Gray" can be used to then colorize the image with an image editor to desired color. The program saves the image in transparent PNG format. Use the parameter "-N" to not use the smoothening scaler. The image then becomes three times larger. A command line program to add a beautiful frame on an image. The program deals with images in the JPEG format. This program makes it easy to make preview images of all video files in a folder structure. For every video file found the program makes an image containing sixteen evenly distributed images from the video file. Instructions: Copy the program to the folder you want to use and run it from there. The program takes help from FFmpeg to read the images from the video files. If you don't have FFmpeg in "C:\FFmpeg\bin\", you set your path with the parameter -FFMPEGBINPATH "Your path". You can download FFmpeg from https://www.ffmpeg.org/. The program saves the images in PNG format. If you want to save disk space, you can run the program AS-PNG To JPEG 1.0 that works the same way. (This program is mainly intended as a complementary program for AS-VidNails.) Use the parameter "/DeletePNG" to delete the PNG files when they have been successfully converted. A command line program to convert twelve digits into a barcode image in the EAN-13 format. The program saves the image in BMP format. The image is drawn in a relatively high resolution, so you can print it with a higher DPI setting and still get high quality. Use the parameter "-H" to draw the image in a higher resolution. The image then becomes twice as large. You can also download AS-EAN8 1.0 to convert seven digits into a barcode image in the EAN-8 format. A command line program to check if a host accepts connections on a specific port. The program supports both IPv4 and IPv6. This is a very simple program that takes the text currently in the clipboard and replaces it with a version where all characters are in uppercase. This is a very simple program that takes the text currently in the clipboard and replaces it with a version where all characters are in lowercase. This is a program to switch between the base colors red, green and blue (and also white and black). The current color is displayed over the whole screen and not even the mouse pointer is visible. The program can be used to discover if a monitor has any defect pixels, because those should appear extra clearly in some of these colors. You switch with [ENTER] and quit with [ESCAPE]. This is a program to switch between the base colors red, green and blue (and also white and black). The switch is made every second, or even faster if you specify the parameter "/FAST" (every quarter of a second). The current color is displayed over the whole screen and not even the mouse pointer is visible. You quit with [ESCAPE]. A suite containing two programs that can play a melody string and two programs that can play a specified frequency (in Hz) in a specified length (in milliseconds). The Sine-programs uses the sound card (in form of sine waves) and the Square-programs uses the sound card (in form of square waves). Can e.g. be used to announce something in a program, script or in a batch file. The programs shows nothing on the screen and when the sound has been played they are closing automatically. Format: PCM (Pulse Code Modulation). E.g. Run => "C:\Andreas Software\AS-SQUARE-MELODY.EXE" "a A f f F g a A g f E p g G e f g e a f D C" => OK. See Melodies.TXT. The parameter "/F=440" specifies the frequency of 440 Hz. The parameter "/D=1000" specifies the length of 1,000 milliseconds (1 second). These values are default if they are not specified. E.g. Run => "C:\Andreas Software\AS-SQUARE-FREQ.EXE" "/F=440" "/D=1000" => OK. I have drawn eight smileys. They are 20 × 20 pixels in size (including transparent padding) and they are in transparent GIF format. You are free to use them however you like. I have drawn a set of dice from one to six, I have also included an empty die. They are 16 × 16 pixels in size (including transparent padding) and they are in transparent GIF format. You are free to use them however you like. This is the BMP version of my dice. They are 16 × 16 pixels in size (including padding) and they are in BMP format. You are free to use them however you like. I have drawn a set of large dice from one to six, I have also included an empty die. They are 32 × 32 pixels in size and they are in PNG format. You are free to use them however you like. This is the BMP version of my large dice. They are 32 × 32 pixels in size and they are in BMP format. You are free to use them however you like. This is a Scale3X version of my large dice. They are 120 × 120 pixels in size (including transparent padding) and they are in transparent PNG format. You are free to use them however you like. This is the BMP version of my extra large dice. They are 120 × 120 pixels in size (including padding) and they are in BMP format. You are free to use them however you like. I have drawn two minimalistic flags, the flag of Great Britain and the flag of Sweden. They are 16 × 12 pixels in size and they are in PNG format. You are free to use them however you like. A small addition to the Windows registry that allows you to right-click on a file (regardless of file type) and open it in Notepad. If you want to link to the website or write about it - here you have the high-resolution logo. Copyright © 1998-2019, Andreas Jönsson. All rights reserved.